Do you remember that AMM album called Before Driving to the Chapel, We Took Coffee With Rick and Jennifer Reed? Of course you do. As it turns out, Rick and Jennifer Reed are actual human beings presently living on planet Earth, and one of them even plays in Frequency Curtain! I’ll let you guess which one. Joining the one Reed during this 2001 recording in their home base of Austin, Texas are Josh Ronsen, leader of an improv music + performance art outfit with the catchy name Brekekekexkoaxkoax and publisher of Monk Mink Pink Punk music magazine, and fellow media artist John Grzinich. 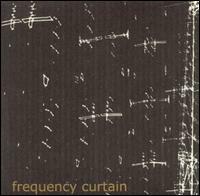 So, what kind of sound does Frequency Curtain offer to you, the discerning music listener? True to their name, they gargle up four long tracks of gritty electronic drones in which the vintage technology of sine wave generators and short wave radios are seamlessly layered with the infinitely itchy aural pixels of modern laptop computers. Painful, high-pitched tones and all kinds of brittle skittles meld with deep synth-like clouds and packs of percolating barbs, forming the perfect menacing backdrop for an all-night slumber party in a pitch black utility closet. And the black, abstract cover and psychedelic disc art–both of which are quite lovely and minimal–match the music perfectly. I highly recommended this CD for any and all drone fans who like it rough. This entry was posted on Tuesday, September 2nd, 2014 at 9:55 pm	and is filed under Frequency Curtain. You can follow any responses to this entry through the RSS 2.0 feed. You can skip to the end and leave a response. Pinging is currently not allowed.